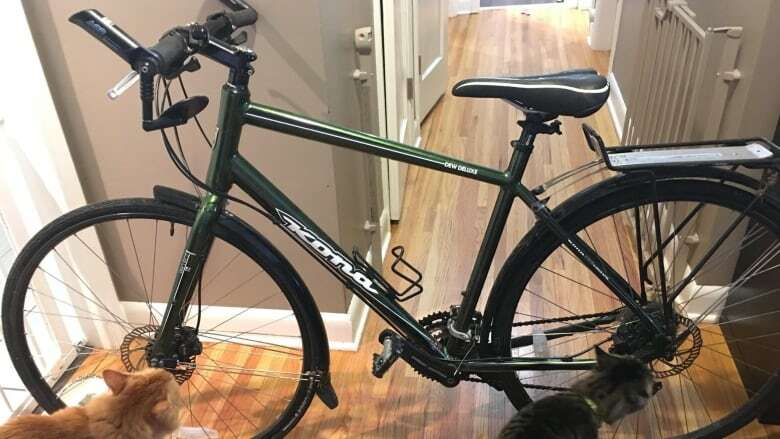 Seven years after Tanya Brucker reported her green Kona Dew Deluxe bike stolen, a late night phone call out of the blue led to a happy reunion. "It was my favourite bike in the world," Brucker said. But not long after buying the bike, she rode it to work, locked it up and then it was gone. "I cheaped out and got a little cable lock and I paid the price," she said. She reported the theft to Calgary police and provided all the information — most importantly a serial number for the bike. For weeks, Brucker said she scoured Kijiji and Craigslist, but within a month she gave up and eventually stopped thinking about it. "Every now and then when I see a green bike, I'll think, is that mine? But really, I gave up hope after that first month," she said. But in late July, her phone lit up with a call from a blocked number. The Calgary police constable on the other end of the line told her they had recovered her stolen bike from some bushes in the city's southeast and the serial number led it back to her. Police were looking to return the bike to her, but Brucker said she didn't know what to expect. After seven years, she was prepared to see a rusted, beat up bike with no tires, but to her amazement, the tires just needed a little air. "The seat post was still in my settings, the bell was still on it. There was nothing wrong with it except a flat tire," she said. Brucker thinks her bike was being stored somewhere and never ridden. Const. Tyler Womboldt is the officer who recovered Brucker's bike. He said the story of Brucker's little green bike illustrates the importance of documentation. "It just shows you the importance of keeping up with your records and documents and all the numbers that are important," he said. As for Brucker, she said she's enjoying riding her long-lost bike. And she has invested in a better bike lock.